Usually when I write these articles, I come up with a quippy tagline for this portion. Something that gives you a brief introduction about the car and the owner that you're about to read about. For this article though, I'm doing something different. The car you are about to read about is brimming with so many stories, and so many miles, that it should really be in a museum. I have been trying to get Jerry's car on this website since I met him at The Subaru Shootout last September, as it is most recognizable as the high-millage phenom that beat a WRX down the track, but the reality is that his car is much more special than that. Jerry's Impreza has such a crazy history of broken parts, owners, and hilarious modifications that the more I learned about his car, the more that I wanted to share about it. So, as a little holiday treat to everyone, I decided to do a special investigative journalism piece for Jerry's article, with more words, and more pictures than any previous YOHB article I've ever done. I set off on a mission to try and discover the bizarre history of the car known that is known by some as "The Green Monster" (TGM), and showcase what this Impreza has gone through in its past, to become the car that Jerry and the rest of you know it as today. I even went as far as contacting some of the previous owners of this car to try and get the best history of this vehicle that I possibly could. We'll eventually get to the usual Q&A portion of this article, but without some context, and knowing the history of this car, I think a lot of what Jerry is referencing in his answers won't make a lot of sense. In fact, I don't even think Jerry knows the full history of his car either! The story of this 1995 Impreza sedan starts when it was originally purchased from a church auction in Tennessee by a local shop owner at the time in the spring of 2005 (or possibly 2006) for less than $500. The car had a bad automatic transmission in it and had roughly 220k miles on the clock, but overall it's Caribbean Green exterior and beige interior was in fairly good shape. The car naturally started to see nicer bits thrown its way and get repaired, just like any good Subaru would. The automatic slush-box was swapped out for a manual one, version 3 seats found their way in, as well as new backseats and other dark grey plastic bits from another Impreza RS that was being stripped down to be a track car. TGM became a test mule for the shop for coil-overs and other little modifications, so the parts list began to snowball. At one point, it had Cusco trailing arms, aluminum front control arms, an anti-lift kit, a version 6 aluminum hood, upgraded sway bars, an eBay intake, headers, and bunch of other things. The car managed to actually see some time at Autobahn and Gingerman racetracks that summer, and although it was slow, it was a great little performer. The car then became involved in a series of strange (and probably unethical) "handshake deals" and trades. As people who worked for the shop needed transportation, it began to get passed around from one person to the next, and changed owners frequently (4 different people during this time actually). It would also find itself wearing snow tires for the winter months, and rarely saw a nice drive with anyone that was behind the wheel of it. This lead to the beginning of the car being ridden hard, and it's good condition started to deteriorate. By now, one of the frame rails was tweaked, the windshield was in need of repair, and the rear quarter panels were starting to bubble up, but there was still a lot of good parts left on the car too. The check engine light was always on, and it was consuming a large amount of oil. I was told by one of these previous owners that during this time, the only time the CEL would go away would be if the car was completely out of oil, and adding more would turn the CEL back on. With all of that being said, the car continued to soldier on. It always started, it was being driven roughly 100 miles a day, and was closing in on 300k miles (it was hard to tell for certain because the odometers stopped working around this time). The 2.2L in the car never faltered, and the previous owner that I spoke to was convinced that the car would probably run even without gas in it. It was at this point that one of Chitown Subarus members - Ryan Rittgarn - purchased the car from the shop owner in 2007, and so began the next chapter of the cars life. Ryan needed a reliable car after the rod bearing in the motor of his bugeye was damaged, and TGM fit the bill perfectly while he started rebuilding the bottom end. He was also never nice to the car, which included him closing the hood with his foot on occasion since the hood latch by then was broken. Ryan taught both of his brothers how to drive stick in this car, and he would eventually sell it to one of them - Erik - when he needed a car. Erik would also put this car through a torture test, which included drag racing it at previous year's Subaru Shootout. Erik would unfortunately slide the car into a curb one day, breaking one of the Outback Sport wheels that it was rolling on at the time. Ryan and Erik would go on to meet another long-time Subaru owner by the name of Jeff Smith - who sold them a 15" steely wheel as a replacement (and then another from him on a separate occasion) and Ryan and Jeff would go on to become good friends. Ryan's attempt at fixing the car involved getting a new control arm, and he pulled the sub-frame straight with ratchet straps, because at that point, it wasn't worth the effort (or the money) to fix it right. The car didn't have great tires on it anyways, so the alignment was also just eye-balled. The driver-side door was bent backwards after Erik accidentally backed out of the garage with the door open one time, and after that was repaired, Erik found a new Impreza RS of his own that he wanted to drive instead, so he sold the car back to Ryan. Ryan decided to do a full seal kit on TGM at this time, and even found another set of 2.2L heads that he wanted to put on the car instead. Unfortunately for him, the original heads were dual port runners, while his replacement heads were a single port. With a little help from RTV, sheet metal, and a Dremel, he was able to get the new heads to match up with the headers to make it work, and get the car running again. He then sold the car to his other brother, Aaron, who backed into someone with it, and had the hood latch fail on him at speed, further damaging the hood and the windshield. The car was driven for a bit more before eventually being sold to Jeff Smith's sister-in-law, Sarah, when she was looking for her first car in 2012. Sarah continued the tradition of driving this car to its death, and did so in spectacular fashion. She had the water pump hose burst on her one day, and drove the car completely out of coolant until the car died. She started it again, drove it until it died a second time, and then started and drove the car a 3rd time until it finally died and would not start again. After the car was towed home, an $8 hose was replaced, and the coolant was filled with tap water, the car started again with no problems, no head gasket issues, and it hasn't overheated since. She also had a friend that she worked with that said he could help her paint the car blue, and against the advice of many, decided to do it anyways (and without prepping the car!). It was at this point that TGM earned a new nickname - Tobias, jokingly based on the character from the show Arrested Development. The Caribbean Green paint would eventually start to find a way to shine though the new "Tobias blue" color, but the car went on to serve Sarah well until she decided that she was now driving an "eyesore". Sarah's parents would keep the car around and use it on occasion for transporting things (Jerry has a story about this below that I won't spoil), but it's at this point that the car had been devalued so much that it started to just sit. The plates on the car expired since Sarah's parents didn't think that it was worth renewing, and it's worth mentioning that two separate homeowners associations in Algonquin complained about the ugly sight that Tobias has become sitting in their driveway. It's at this point of the story were Jerry and another Chitown Subaru's member - Tyler Stallard - finally entered the picture. After the 5-speed gearbox in Jerry's 2006 WRX wagon failed (not surprisingly), Jerry had resorted to paying for a rental car while he was repairing his Subaru. Tyler and Jeff were already mutual friends, and when Tyler introduced Jeff to Jerry at a local car meet, they hit it off right away. Jerry told Jeff that he was paying about $30 a day for a rental, and it occurred to Jeff that if Jerry just paid for insurance and the plates on Tobias, Jeff's in-laws would probably let him use it as long as he needed. So Jerry did just that, and drove it for a few months and fell in love with the car. A rear wheel bearing failed on Tobias while he was driving it, and that was the last straw for Jeff's in-laws. Jerry loved the car so much that he bought it from them in early 2015, which brings us to today's article. If there is one car in all of Chitown Subarus that I have been dying to write about, it's probably this one. I really love seeing all of the different cars everyone has in this group, but this car is so rich with character and history, it was really hard for me to not get excited about it. This car has probably close to 400,000 hate-driven miles on its original motor, and considering what it's gone through already, I'm convinced that it still has more left in it. On average, it's 238,855 miles to the moon. What other car that's been beaten to hell that you know of can say that it's on it's return trip back to Earth? This car not only represents what I love about the Subaru brand and how awesome these cars are, but it shows that the owners of these cars make it special too. This car brought a lot of people together who may have never been connected, which I think is an interesting story by itself too. Jerry's car has transcended beyond being just a metal vessel of transportation and tomfoolery - it's become an iconic piece of different people's lives, and all of the people that I spoke to couldn't wait to dig up old pictures and tell me old war stories. Some people will never understand the connection that gear-heads have with their cars, but I think even if those people took a step back and looked, it would be pretty easy to see the bond that these people share with this car, and each other. Jerry now proudly carries the ownership torch of Tobias, and has put a few touches of his own onto this car. He has managed to keep this legendary car going in the most Subaru way possible - by rally-crossing it. 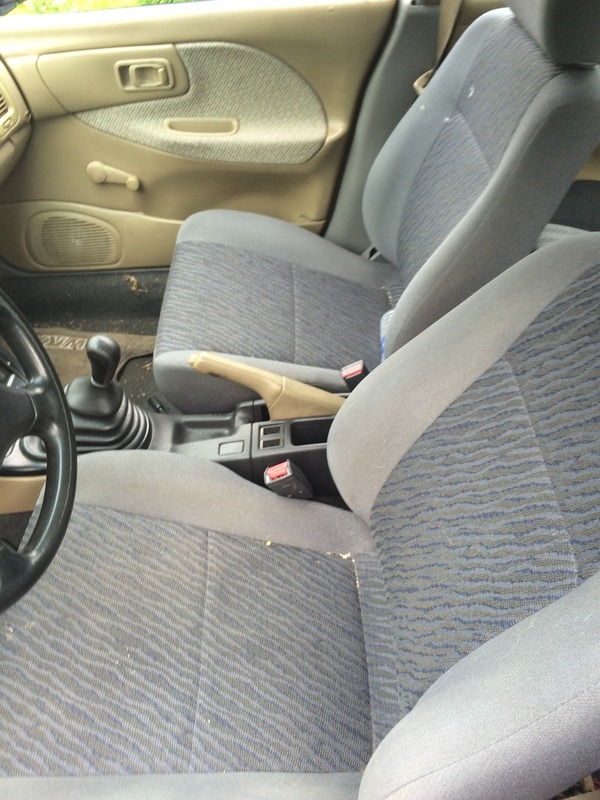 Jerry's car: 1995 Subaru Impreza sedan. 2.2L all wheel drive and manual. Exterior: 2001 Impreza OBS front bumper, cut out center, Aluminum hood, galaxy painted. Cut outs sealed with plexiglass. Interior: Bugeye WRX front and rear seats, Touge Factory e-brake drift button for a BRZ, Volt meter gauge from Auto Zone, Neons yo! Tell us a little about yourself: I am a service writer/shop manager at a mechanic shop. Been there for four years. I ride motocross and enjoy motorcycles, I like history, working on cars, reading fiction, Star Wars, and a bunch of other stuff. I enjoy working with my hands, either on cars or building stuff with wood. I also do spray art. How did you get into cars? My dad owned a dealership when I was a kid. I would hang out in the shop and get my hands dirty, “helping” the mechanics. What is your dream car? A 1949 Chevrolet Fleetmaster Fastback. I would also love a 1993 240sx hatch, in white. What are your future plans for the car, and what do you like to do with it? I plan on riding out the stock 2.2L until it blows up. I am currently collecting parts and planning a swap for my EZ30D. I have the motor, but still gathering parts. Come spring, I will also be spray painting the car all one color. Not sure which color yet. What's your favorite thing about your car? It looks like an absolute turd, but is more reliable than most of the cars on the road. I would drive it to California and back. I love the way people look at the car, thinking it’s a junkbox, but I know it will outlast their overpriced newer cars. What is something that you don't like about your car? Its reallllly slow. What is your car like to drive? Well it’s extremely loud and slow, and third gear is a curve-ball. Being an old crusty turd but always coming through when I need it to, I imagine this is what it’s like driving the Millennium Falcon. What was your inspiration or objective with this build? My inspiration was to build a rally car for as cheap as possible. I wanted to get into motorsports, but it is expensive. This car gave me an in. My goal was to have the ultimate budget rally missile. Why did you choose a Subaru? My buddy Tyler Stallard convinced me to get a Subaru. I was looking for something I could drive comfortably all year round, 4 door, manual and faster than my Honda and Jeep. And I have always wanted a wagon. Before this Subaru, I had a 2006 WRX Wagon Limited. I bought this car to get me through one winter when my 5 speed blew up on that car. What was your first car? 1999 Jeep Grand Cherokee Laredo. Lifted 4 inches with 33 inches tires. What makes your car special to you? It has such a long and unique history, I feel proud keeping the car alive and adding to the story. It is special because of the absolute torture and thrashing I put this car through, and it’s resilience to never let me down. I have learned a lot about Subarus by working on this car, and we have a special bond due to all we have been through. What is something about you (or your car) that no one else would know about? I heard this story from Jeff Smith. Apparently his uncle, if I remember correctly, went hunting. They ended up getting a big deer. With nowhere else to put it, they shoved the deer into the trunk of the car. Also, the Impreza’s nickname is Tobias. Jeff Smith named the car after Tobias from Arrested Development, due to their matching horrible blue paint jobs. Any memorable moments with you car that you would like to share? My first Halloween with the car, I dressed up as The Stig and tried racing people. Helmet and all. One guy in a construction van looked over at me and put on his hard hat. We ran them on green. Any shout-outs to anyone who helped you along the way? First and foremost Jeff Smith, who has helped me out with donated and cheap parts to keep Tobias on the road. He is also the one I turn to for advice and help when I need an Encyclopedia for Subarus. I want to give a shout out to Tyler Stallard. He has also donated several parts to this car. Tyler has taught me a lot about the Subaru world as well and I’m glad to call him one of my best friends. I also want to give a shout out to Peter Mika for helping me with my head gaskets on my daily, and for a bunch of free goodies for the build. I appreciate all the help. Most importantly, I want to give a shout out to my boss and friend, Dave at Mastertek Auto Repair. He has been a mentor to me and taught me everything I know about cars. From letting me use the shop and helping me through new fixes, I owe him more than I can give. Editors Note: Jerry has done a TON of work on this car himself. Between his own modifications and undoing a lot of the work of others, he is keeping a log of everything over at RS25.com. You can read all about this car's adventures here, and check out more of his pictures and videos documenting everything. I left some of these details out of this article, as this is really Jerry's part of the story to share, but I highly recommend checking it out if you're interested in what other "special modifications" were done to this car.